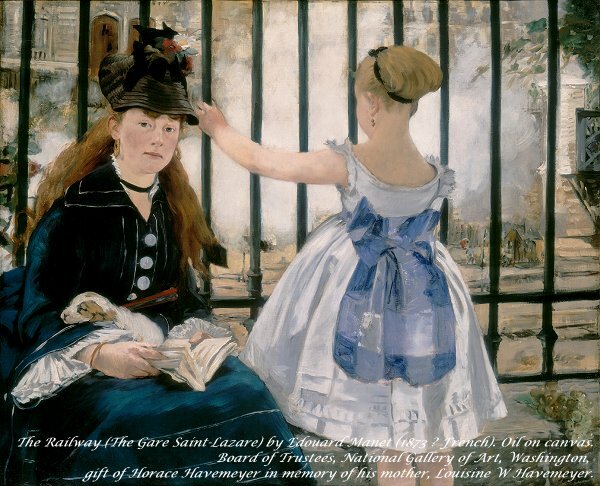 Art History News: "Manet, Monet, and the Gare Saint-Lazare"
Èdouard Manet's The Railway (Gare Saint-Lazare) (1872- 1873), one of the most admired and enigmatic masterpieces in the collection of the National Gallery of Art, was the focal point for Manet, Monet, and the Gare Saint-Lazare. 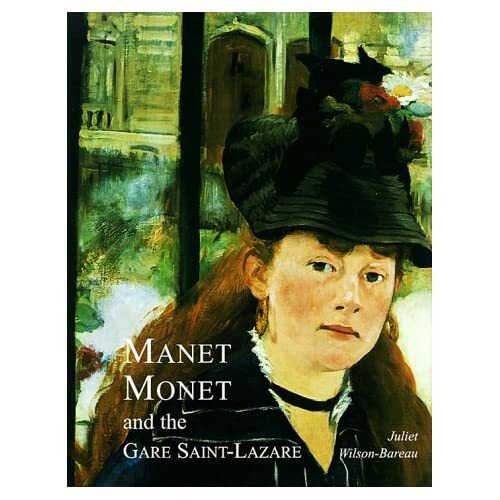 Thirty-eight other celebrated paintings and related drawings by Manet, Claude Monet, Gustave Caillebotte, Berthe Morisot, and other impressionists, as well as prints and period maps also provided a fascinating glimpse of Quartier de l'Europe, the vibrant, late-nineteenth century Parisian neighborhood where these artists lived and worked. This will be the first time that all of Claude Monet's eleven paintings of the Gare Saint-Lazare will be on view together. The exhibition was organized by the National Gallery of Art, Washington, and the Réunion des musées nationaux/Musée d'Orsay, Paris. The exhibition was on view at the Musée d'Orsay, February 12 - May 17, 1998 "Manet's The Railway met with derisive criticism when it was exhibited at the Paris Salon in 1874, but today scholars and art lovers come from all over the world to study and enjoy it in our French impressionist galleries," said Earl A. Powell III, director, National Gallery of Art. "We are grateful to The Florence Gould Foundation, the Federal Council on the Arts and Humanities, and the museums and collections, which made it possible for us to present some of the impressionists' greatest achievements." Loans came from museums and private collections, including the Musée d'Orsay, Paris; the Kunsthalle, Hamburg; and the National Gallery, London; as well as American museums such as the Fogg Art Museum, Harvard University Art Museums; The Metropolitan Museum of Art; the Museum of Fine Arts, Boston; and the Kimbell Art Museum, Fort Worth. In their art, the impressionists and other artists celebrated modern city life in the years of hope following the Franco-Prussian War and the Paris Commune (1870-1871). The Quartier de l'Europe, as it is still known, had been recently developed by Baron Haussmann around the famous Saint-Lazare train station. Working in the train station itself, Monet captured the energy and excitement of the locomotives in a series of dazzling canvases executed on the platforms, while Gustave Caillebotte painted dramatic perspectives in the nearby streets. his dazzling image of Nana a year later (associated with Emile Zola's notorious novel of the same name), and views of Paris such as the street outside his studio, spanned the artist's career from the early naturalist phase in the 1860s through the maturation of his impressionist style in the 1870s. Famous paintings of model Victorine Meurent, who served as his inspiration for the early phase of his career, include not only The Railway, but also The Street Singer (c. 1862), and Young Lady in 1866: Woman with a Parrot (1866). Berthe Morisot's painting Woman and Child on a Balcony (c. 1871-1872), depicting her sister against a panorama view of Paris, reflects the influence of her mentor Manet. 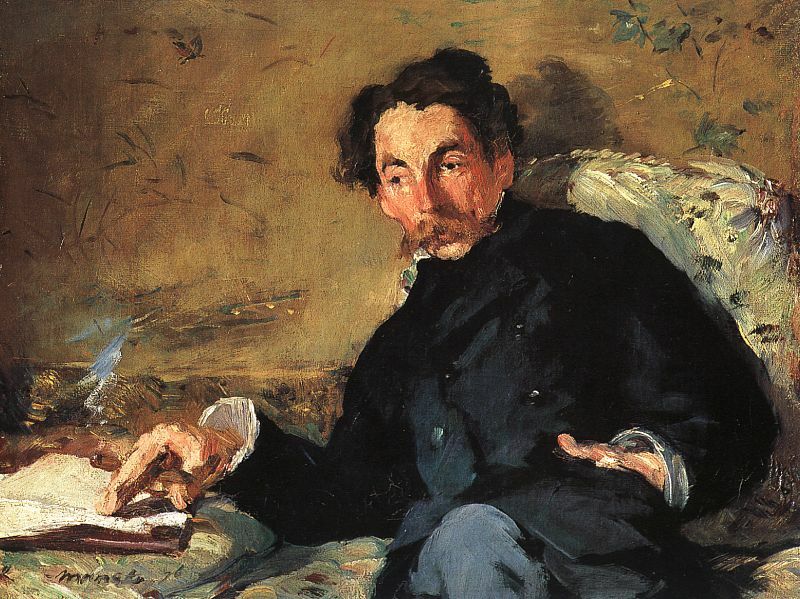 The exhibition also featured the famous painting by Henri Fantin-Latour, A Studio in the Batignolles (1870), with Manet seated in his studio at his easel surrounded by younger artists Monet, Renoir, and Degas, and writer Emile Zola, among others. Less well known, but no less celebratory of the Gare Saint-Lazare and its neighborhood, are works in the exhibition such as Norbert Goeneutte's lyrical evening depictions of the train station and the city beyond, and Jean Béraud's fashionable Parisian street scenes. Two of Monet's sketchbooks will be open to the pages featuring the drawings he used for his Gare Saint-Lazare paintings, along with a page from a Manet sketchbook that contains the only known preparatory study for The Railway. There will also be poignant war prints by Manet, and a group of rarely seen satiric caricatures by a variety of artists. The exhibition was selected by guest curator and noted Manet scholar, Juliet Wilson-Bareau; Philip Conisbee, senior curator of European paintings, National Gallery of Art; and Florence E. Coman, assistant curator of French paintings, National Gallery of Art. A fully illustrated catalogue written by Juliet Wilson-Bareau, published and distributed by Yale University Press, accompanied the exhibition.